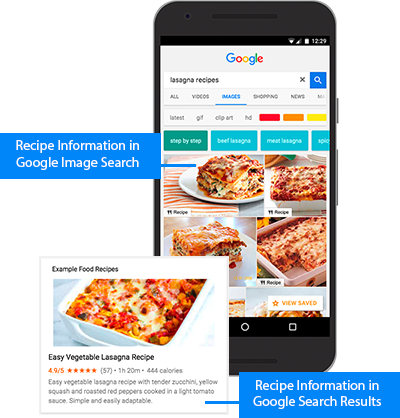 Search: Add recipe structured data to drive better engagement in Search with rich results. Guidance: Enable the Google Assistant to guide users through your recipes on Google Home and smart displays. Carousel: Add carousel structured data to enable your recipe to appear in a carousel of rich results. This can include images, page logos, and other interesting search result features. AMP: Build your recipe pages with AMP to provide instant-loading recipes. Note: Support for recipe content on smart displays is currently only available to select partners. If you would like your recipe content to appear on smart displays, fill out the interest form. Try our new Structured Data Codelab. This codelab walks you through adding recipe and review structured data to a simple HTML site, including where to place structured data on a site and how to validate it. Here are some examples of recipes using JSON-LD code in the Structured Data Testing Tool. Here's an example of a page with recipe and guidance structured data. This content can be eligible to be displayed as a rich result in Search results and guidance with the Google Assistant on Google Home and smart displays. Here's an example of a recipe summary page (a page with a list of recipes) with itemList structured data. This content can be eligible to be displayed in a carousel in Search results. You must follow the general structured data guidelines for your recipe to be eligible to appear in Search results. To enable your recipe for guidance with Google Assistant on Google Home and smart displays, make sure your content follows the content restrictions policy for Actions on Google. If you violate these policies, your recipe might not show up as a rich result, but your content will still appear in Search results. Read about Spammy Structured Markup.